ITP MEGA MAYHEM 27-11-14 $131.80 with Free Shipping! ITP MEGA MAYHEM 27-9-14 $128.80 with Free Shipping! ITP MEGA MAYHEM 27-11-12 $124.80 with Free Shipping! ITP MAMMOTH MAYHAM 32x10x14 FREE SHIPPING $218.80 per tire Incredibly smooth ride Mammoth 2 inch lug depth Extended wear compound 6 ply rated for added puncture resistance. The Monster Mayhemn mud/trail tire has a 30-inch diameter and 1.75-inch tread depth. According to ITP, it’s unique tread pattern gives it a smooth, quiet approach on harder surfaces. As well, ITP says its lightweight 6-ply carcass offers exceptional acceleration, braking and maneuverability. 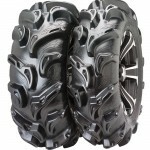 The Monster Mayhem mud/trail tire has a 30-inch diameter and 1.75-inch tread depth. According to ITP, it’s unique tread pattern gives it a smooth, quiet approach on harder surfaces. As well, ITP says its lightweight 6-ply carcass offers exceptional acceleration, braking and maneuverability. 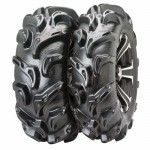 ITP MONSTER MAYHEM 30x10x14 Free Shipping The Monster Mayhemn mud/trail tire has a 30-inch diameter and 1.75-inch tread depth. According to ITP, it’s unique tread pattern gives it a smooth, quiet approach on harder surfaces. As well, ITP says its lightweight 6-ply carcass offers exceptional acceleration, braking and maneuverability.